Some time ago I reviewed an application called GIMP (GNU Image Manipulation Program) as I was getting tired of using Photoshop for relatively simple image manipulation tasks.One cannot deny that Photoshop is an extremely competent and extensive program but it is also extremely resource hungry and not to mention expensive; it seemed somewhat akin to using a sledgehammer to squat a mosquito. 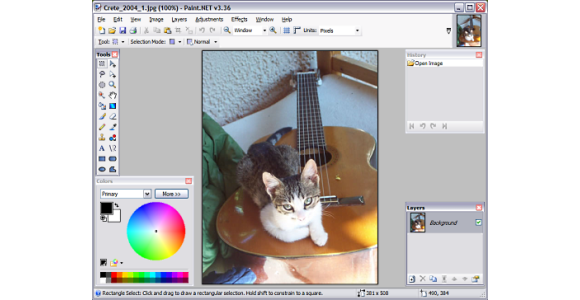 GIMP is ideal for many home users as it is a small and free application which boasts a large number of features that would probably prove sufficient for who needs something slightly more than Microsoft Paint but less than Photoshop.My only reservation with the application was that the UI (User Interface) was a little bit inconsistent with the overall feel of Windows and as a result it takes a while to get to grips with and often feels alien to the average PC user. This week I stumbled across another very capable application called Paint.NET which once again is free to download and use.Unfortunately it is not quite as powerful as GIMP but for most users this will be compensated for by the fact the interface will be extremely familiar to the average Windows user, to the point where it is almost intuitive, resulting in a much easier learning curve.The majority of users will find the features of Paint.NET more than enough for day to day photo manipulation however also thrown in to the mix are a number of extremely powerful tools. First and foremost the application supports layers; unless you’ve ever used layers it’s difficult to explain in words exactly what they are and how they can help you.The simplest analogy would be to think of them as a number of transparency slides, which when all stacked and viewed together form the basis of a whole image.If you change one of the individual slides the overall image will look different, but no changes will be made to the other slides.This means that changes that you make to one layer which are later altered won’t result in a trial of obvious damage to the image caused by previous alterations. Another nice feature is the way that the application handles multiple images; rather than having a number of windows that can be minimised and reopened as and when necessary, Paint.NET has a clever style of tabbed interface.In order to navigate between open files you simply click a thumbnail of the image from a scrollable selection on the top right hand side of the screen. Additional features, updates and bug fixes are released on practically a monthly basis and there is an active forum that offers a number of plug-ins, should you require any extra functionality that isn’t provided as standard. In terms of special effects, the application has a large number built in as standard; ink sketch, oil painting, blurs, distortions, noise control, red eye removal, sharpening, softening and so on.The image can also be manipulated by way of adjustments such as hue, saturation, level, brightness, contrast and sepia controls.The standard drawing and selection tools are provided and of course the intensity, tolerance or size of these tools can all be easily adjusted as necessary. One selling point of GIMP was that it is cross platform compatible however Paint.NET can only be used in Windows and more specifically in the later versions, either XP or Vista.This is unlikely to be a problem for most my readers so if you found GIMP a little confusing and don’t have the time, patience or money for Photoshop then I would urge you download this tiny 1.6mb application by visiting www.getpaint.net.